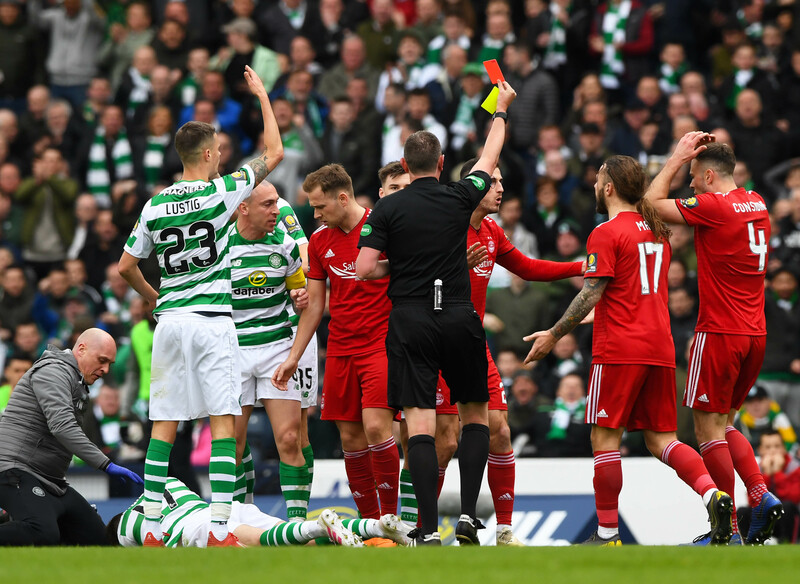 With the match looking destined to be goalless heading into the interval, Aberdeen were dealt a blow when Dominic Ball was shown a second yellow card for a harrowing collision with Ryan Christie, who was forced off after being knocked unconscious in the clash. The Hoops opened the scoring through James Forrest in stoppage time, with second half goals following from Odsonne Eduoard and Tom Rogic, who had been on the receiving end of a shocking challenge from Lewis Ferguson which produced a second dismissal. 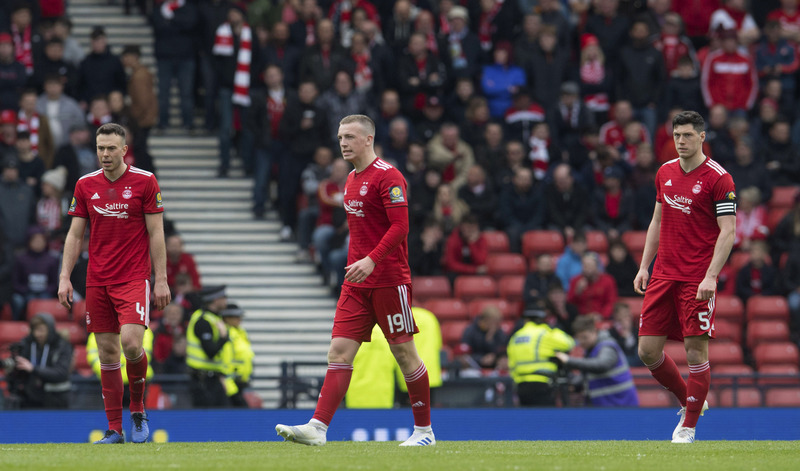 The result leaves Derek McInnes’ men to solely focus on their bid to secure European football through the Premiership, with Celtic now a final against Hearts away from completing a triple treble under caretaker boss Neil Lennon. The Dons were already without suspended skipper Graeme Shinnie, but dealt a further blow with on-form Niall McGinn ruled out through a foot injury which looks likely to rule him out for the remainder of the campaign. McInnes put his faith in teenage midfielder Dean Campbell, while Stevie May was also drafted in to support Sam Cosgrove up front. 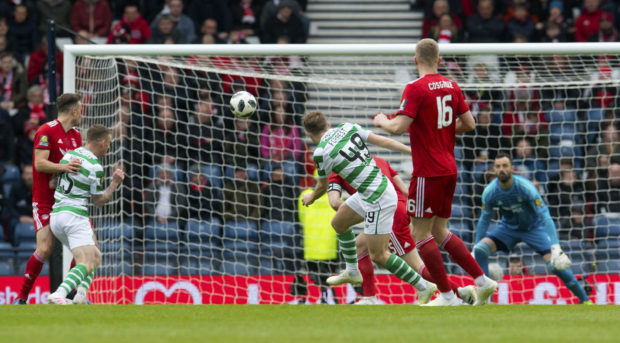 Celtic started the game on the front foot and tested Joe Lewis after just three minutes, with the Dons goalkeeper forced to tip Jozo Simunovic’s early strike wide, before the defender stabbed wide from Ryan Christie’s resulting corner. The Dons survived a close scare midway through the first half when Andy Considine made contact with James Forrest as he bore down on the penalty box, however referee Craig Thomson opted to book the Celtic winger for going to ground too easily. The Dons made intermittent breaks forward but struggled to mount pressure on Scott Bain’s goal, with their first meaningful attempt coming on 36 minutes when Dominic Ball crossed in for Cosgrove who knocked the ball wide on the first time volley. Ball’s final intervention came only moments later however, when he was shown a second yellow card for going in heavily on Christie, who was knocked out in the collision and had to be stretchered off, with six minutes added on. He was replaced by Tom Rogic, while McInnes reshuffled by bringing Michael Devlin on for May. Although the Reds threatened shortly afterwards when Lewis Ferguson nodded Greg Stewart’s cross wide, Celtic made the breakthrough in first half stoppage time when Forrest cut inside on to his left foot before stroking high past Lewis from long range. Forrest could have netted a second before the interval, but saw a low effort blocked by the legs of Lewis. Aberdeen kept Celtic at bay in the early part of the second half, however they gifted the Hoops a second goal just after the hour mark when substitute Devlin failed to clear his lines before hauling Jonny Hayes to the ground, allowing Eduoard to roll calmly past Lewis from the spot. Ferguson followed Ball down the tunnel on 67 minutes for a reckless lunge on Rogic, with the Australian piling further misery on the Reds two minutes later when he angled low strike past Lewis from distance. McInnes was later sent to the stand by Thomson on a thoroughly grim day for the Pittodrie outfit.